Puerto Rican boxing great Hector "Macho" Camacho has died in hospital after being taken off his life support machines, doctors have said. The former world champion was clinically brain dead after being shot in the head in a drive-by shooting near the capital, San Juan, on Tuesday. The boxer, who was 50, fought some of the great names of boxing during a three-decade career. They included Oscar de la Hoya, Sugar Ray Leonard and Felix Trinidad. Camacho was being treated at the Rio Piedras medical centre in San Juan. The centre's director Ernesto Torres told reporters that the former boxer went into cardiac arrest in the early hours of Saturday morning, was taken off life support and died shortly after. Earlier Camacho's mother Maria Matias said she wanted doctors to remove her son from life support. His eldest son, Hector Jr, had indicated he wanted to keep his father alive, but his mother had the final say. Camacho was shot in the head on Tuesday while sitting in a car outside a bar in his home city of Bayamon, outside the capital San Juan. His friend Adrian Mojica Moreno was killed in the attack. Police said the car contained bags of cocaine at the time of the shooting, but said they did not know of any motives behind the attack. Camacho was known for his flamboyant style and skill in the ring. He was born in Puerto Rico, but grew up in New York where he made his professional debut in 1980. He went on to win four world titles across three weight divisions, beginning with the WBC super featherweight title in 1983. His last fight was an attempted comeback against Saul Duran in 2010, which he lost. By then he had become known for his troubled personal life and run-ins with the police. Camacho was sentenced to seven years in prison for burglary in 2007, though the sentence was later suspended. He was found in possession of drugs and was the subject of a restraining order brought by his ex-wife, who complained of domestic abuse. At the time of his death he held a career record of 79 wins, 6 losses and three draws, with 38 knockouts. 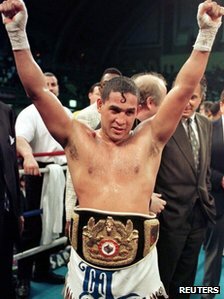 Hector Camacho fought everyone there was to fight in a long and eventful boxing career but it was for his showmanship and reckless approach to life that he will be best remembered. Camacho became as renowned for his outlandish ring entrances and outfits - he once fought Sugar Ray Leonard dressed as a Roman soldier - as he was for his blinding hand speed. Given the speed that he lived his life - drink, drugs, women, fast cars, he gorged on them all - it was a miracle he made it to 50. 1990: Experiences first professional loss to Greg Haugen but wins the rematch two months later to regain the WBO light welterweight crown.